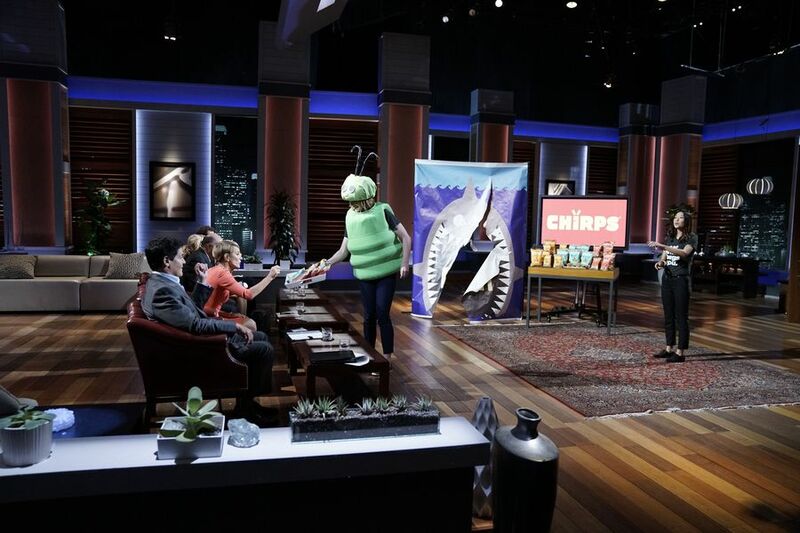 Two college roommates from Harvard Laura D’Asaro and Rose Wang walked into the Shark Tank seeking $100,000 in exchange for 7% equity in their company called Chirps. Crickets are one of the healthiest and most sustainable protein sources available. The question, however, is how to get people to eat bugs and make them excited about eating bugs. Chirps are likely to taste like good corn chips but provide as much protein as egg white and 30% less fat than regular chips. They are non-GMO, gluten-free and of course all-natural. In every chirp, there is only one cricket containing 4 grams protein. The idea came up when Laura was staying in Tanzania and tasting fried caterpillars for the first time. Soon after making a research and found out that eating insects was really healthy and sustainable and she was curious about why people are eating bugs. At the same time after receiving an article from Laura, Rose came back from China where she just had a fried scorpion. Ultimately, Chirps was born. When it comes to costs, a small snack size is at $1.99, which costs them $0.48 to make and the big one retails at $3.99. They have just signed on with the two biggest natural distributors in the US, which helps them get the manufacturing cost down to $0.40. They are currently selling Chirps in airport stores and 29 food courts. For the sales, Rose expected to end up the year with $200,000. But it was not enough for the two young ambitious entrepreneurs. They claimed that they could increase the sales to $1.5 million next year. At the moment, their biggest clients are museums, zoos, aquariums and theme parks. Also, they partner up with the biggest theme park in South East and they believe that at each of the parks they can get 100 sales every week, which is more profitable than natural food stores. Rose explained that there was yet no cricket chips on shelves, which would be an amazing marketing and easily attract customers to stores. Besides, they also won over $200,000 in pitch competitions and still they own 100% of the company. To add to this, they think that cricket flour could be a great replacement like a shake or juice or similar things. Kevin believes that it is a multi-million franchise and is concerned about stealing share from an already established market. Mark Cuban quickly jumped in to say that the idea obviously interested him so much that drove him to make an offer at $100,000 for 20% stake, which caused Lori to back out. Mark then pushed them for an answer and they countered at $100,000 in exchange for 15% equity, which he accepted. The company is currently selling their products on the own website. At the moment, they have 3 types of chips which are BBQ, sea salt and cheddar, and 2 types of cookie mix. To get more information about Chirps Chips, please visit chirpschips.com. There are 3 main reasons why you should try this type of chips: it’s healthy, delicious and sustainable. Did you know that it takes 2,000 gallons of water to produce 1 pound of beef, whereas crickets only take as little as 1 gallon of water to produce one pound. There are over 2.5 billion people from 80% of the countries in the world who are already eating crickets. Chirps are delicious and crunchy. As you already know, most regular potato chips are just carbs. However, chirps are full of protein and 30% less fat than normal chips. The best thing about this is that cricket protein is a complete protein with all essential amino acids. The cricket flour increases the richness of the chips by adding a nutty flavor. The main ingredients are a mix of cricket flour with corn, beans and chia seeds.